On Saturday night, while Milton was waiting to board the cross-town bus to transport him to my place so we could head downtown together to attend Albee’s birthday party, an incontinent pigeon disrupted our plans and dropped its load on his shoulder. Instead of following Plan A, we followed Plan B; Milton arrived at my place, we laughed like two pre-adolescent girls while photographing the mess, and then he proceeded to vigorously scrub the turd off his jacket with Palmolive and a sponge (which was immediately discarded). One of the guests at the party, a very personable woman whose name I unfortunately did not grasp for I am nearly deaf as a post and the venue was rather loud, told us that when she was residing in Venice many years ago, a bird dive-bombed her in the headscarf. She whipped it off, crumpled it up, stuffed it in her satchel and went about her day. Afterward, when she went to launder the scarf, a giant hole was now where the fallout had landed. This sobering revelation made us ponder what toxic ingredients must be swimming in those storied canals. Milton and I figured that his turd primarily consisted of standard discarded Gotham City food fare – pizza, pretzels, bagels, maybe some Mickey D’s, a Dunkin’ Donut, etc. I am sure if he woke to a hole in his jacket’s shoulder, I would have been immediately notified of this development. 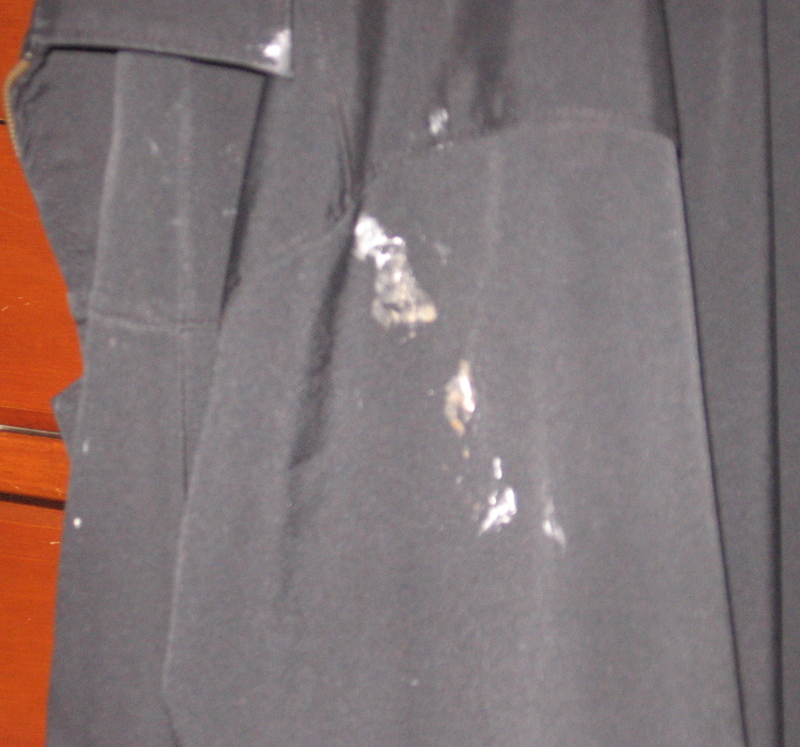 Something else our delightful fellow partygoer mentioned is that being pooped on by a bird brings good luck. Why is this so? According to Wiki-answers, “Somebody came up with the idea that it’s good luck because it’s so disgusting that there MUST be something good about it.” Elsewhere on the web someone referred to this as a “bird blessing.” We both failed to ask what unforeseen fortune the Poisonous Pigeon of Venice bestowed upon our fellow partygoer, but having the quick reflexes to tear off that scarf before that vile turd could eat a hole through her head could have been the prize. She seems to be happily married to a great guy and their offspring is about to graduate college. 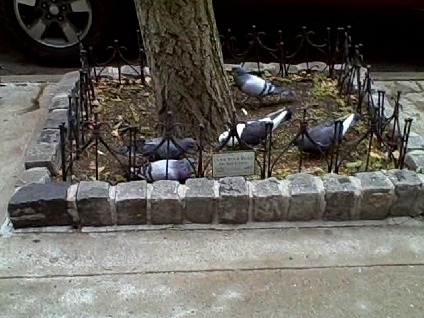 As for what luck the Carb-filled Pigeon of the East Side could have delivered Milton’s way that remains to be seen. Possibly it’s something as simple as only being pooped on by a bird, as opposed to a drenching of dung from a flying rhinoceros, or maybe he should immediately buy a lottery ticket, and see if the odds of winning big are now suddenly in his favor. The first thing he might do with his windfall is buy a new jacket — and frame the old one. This entry was posted in Humor and tagged pigeon poop, pigeons, venice. Bookmark the permalink.